Hanging with the fam over the holidays? Say no more. We’re breaking down four of the best meditation apps out there to help you stay sane and emotionally stable – no matter what your mother says. This free meditation app allows you to set a timer and enjoy a meditation break of any length accompanied by a few soothing ambient sound options, like raindrops and eternal streams. Our favorite feature is a basu bowl and wood block sound that you can use as a timer during your practice or a reminder to do it daily. Just hearing the timer starts us headed toward a more peaceful place! 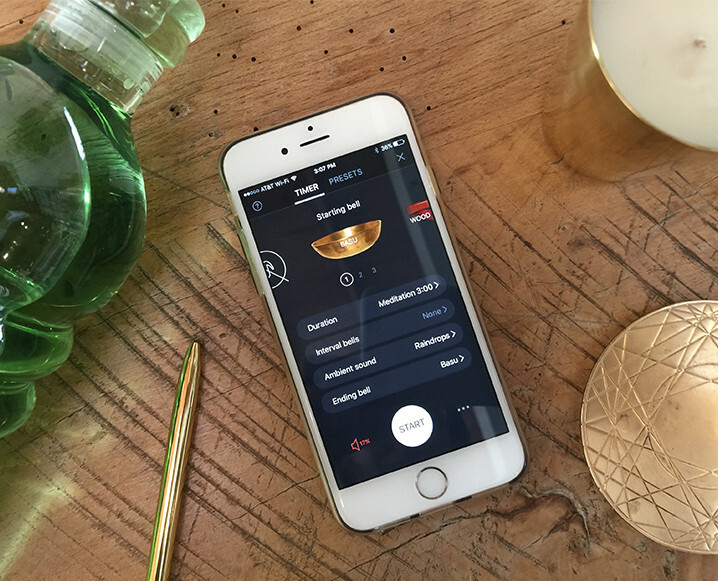 This meditation and mindfulness app is perfect for busy people. It offers accessible 5-minute guided meditations from highly vetted teachers, addressing hundreds of specific topics, from deep sleep and stress reduction to study breaks and morning sickness. If calm is what you need, find it with this app’s 7-day starter program. Each day, try a different 10-minute guided meditation on functional topics ranging from mindful awareness to patience. The paid version of the app offers a massive inventory of super specific meditations including: loving-kindness, forgiveness, deep sleep, focus and even one for kids. We also love that the main page displays soothing sounds and images of nature – think forest rain or a breezy tropical beach – to provide something visual to focus on while mediating. Headspace is ideal for those just beginning to build a habit of meditating. Their level-one course offers daily 10 minute meditations that focus on a variety of topics including foundation, health, and performance. The app also allows you to set reminders and has a buddy system feature to share the journey with a friend. Share the post "The 4 Best Meditation Apps To Stay Sane On-The-Go"
This is the best thing about technology! New helpful apps for meditation come handy and can be accessed through our smartphones. Staying healthy and fit even during holiday season will now be easier with these meditation apps. Through these simple meditation routines, more people would be inspired to live a healthier lifestyle. Insight Timer is my favorite application. You can get all these paid apps for free on your Android or iOS devices using Vshare app store.